Although Success With Money is a free educational site for its visitors, it is made possible by income generated through affiliate marketing relationships and/or through the sale of products produced internally. I want to thank those who choose to purchase items from the site and appreciate the support. It is important for me to state clearly that this particular site has as its purpose to insure that all the information needed to help people succeed with their money is freely offered on the site. All cost items are offered as extras, additional reading material or helpful tools to make life a little easier for readers who want them. In addition, my goal in offering any product or service is in keeping with my educational purpose in starting the site in the first place. While I can personally present all essential information, there are some optional areas that I would not likely cover. For example, some readers might want training in a specific home based business that is practical and worthwhile. If I find a good resource I would consider recommending it. Whenever possible I will recommend free materials. In every case I intend to only recommend what I know to be of exceptional value and at the lowest cost possible. 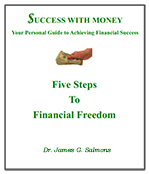 There are many financial products that are quite profitable for those selling them but you will not find them here. I will not recommend anything that I do not value. For example, many credit card companies offer good money for linking to their more expensive products. I think they are a waste of your money and do not recommend them, nor will I promote them. NOTE: if there are advertisement in a banner or in the side columns from Adsense or some advertising company please be advised that those ads do not constitute an endorsement. Those ads are placed by the advertising company and not by me. As I establish relationships with various providers I will attach any information they require to be posted here (following my comments). For example, Google Adsense (those familiar ads you see on so many sites and required even when there is no affiliate relationship in order to use the custom search bar I have at the top of most pages) and Amazon are two companies that require such statements to meet legal, regulatory and business requirements.